On Friday, October 13th, Urban Initiatives partnered with the Wilmette Wings for the 17th Crosstown Classic. Team Goudy (Uptown), Howe (Austin), Nobel (Humboldt Park), North River (Ravenswood Manor) and Jahn (Roscoe Village) traveled to Wilmette for a day full of soccer, family fun and pizza. 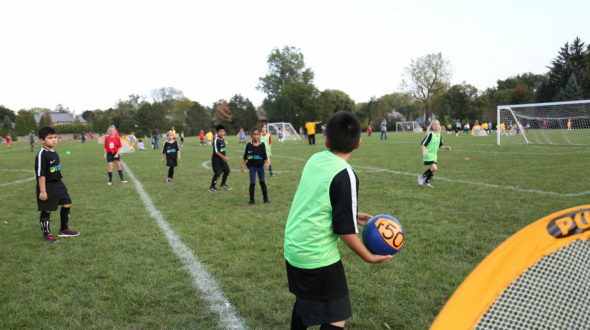 Mixed in with the participants from Urban Initiatives were 60+ soccer players from the Wilmette Wings Soccer Club. Players from both UI and the Wings were able to play ​together ​on ​the ​same teams, ​creating a ​fun ​atmosphere ​of ​teamwork ​and promoting ​active ​and ​healthy ​lifestyles, ​while ​bringing together ​diverse ​communities and celebrating ​the ​beautiful ​game! The Family Fun Zone made its debut at this year’s Crosstown. Games such as giant Jenga, twister and an obstacle course handcrafted by coach Christina made it a huge attraction. We believe building a brighter future for Chicago’s youth is a team effort and lasting relationships are key to our success. From our staff and participants to our supporters and the communities we serve, we value the support of soccer clubs like the Wings that help develop these meaningful and empowering connections. Our students look forward to Crosstown Classics and work hard in the classroom all week in order to attend. As games were being played, you can see a great deal of collaboration between Urban Initiatives and Wilmette Wings players. As goals were being scored, high fives were being given. Both clubs were passing to each other and sharing the fun. Not only were the players working together on the field, but parents from both Urban Initiatives and the Wings came together to help run our volunteer stations. With 200+ kids, serving pizza is no easy task! It was so great to see everyone so engaged from start to end. We cannot wait to do it all over again next year.